At the AES SoundToys (formerly Wave Mechanics) is announcing the new SoundToys TDM Effects Bundle for ProTools TDM on Mac OSX. The new comprehensive effects bundle includes nine effects plug-ins for professional audio, sound design, post production, and audio for gaming : EchoBoy, SoundBlender, FilterFreak, PhaseMistress, PurePitch, PitchDoctor, Tremolator, SPEED and Crystallizer. 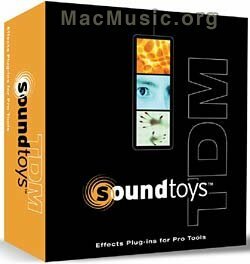 SoundToys TDM Effects Bundle will be available in early Q4 2005 for $1,195.00.